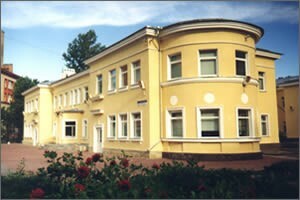 St. Petersburg Christian University (SPbCU) had its origins in the early 1980’s. Since it had not been possible to provide theological training to Christian leaders in the Former Soviet Union (FSU) there was a great pressure to make a modest beginning. The missionary organization, LOGOS International, was organized in Germany for the purpose of offering a program of Theological Education by Extension (TEE) in the FSU. After a number of years of successful TEE courses in several cities, a resident Bible School was established in 1990 in the Krasnodar region of Southern Russia. In a collective farm village on the eastern edge of the city of Belorechensk, the Russian Bible Institute “Logos” began its operation in the fall of 1990 with 45 students. In 1992 the Institution was transferred to St. Petersburg, the location of the first evangelical Bible School before the Bolshevik Revolution. The program of studies was extended from one year to 3 years and in 1993 the name was changed to St. Petersburg Christian University. In May 1993 the first graduating class of 15 students received their Bachelor of Theology degrees. Members of the first 3 graduating classes have founded two Bible Colleges (in Kishnev Moldova, and Krasnodar Russia), four Bible Schools (in Maikop Russia, Volgograd Russia, Siberia, and Militopol Ukraine) and became leaders in a number of church planting endeavors in the FSU. A number of our graduates have continued in graduate studies in Russia, North America, Israel, and South Africa to prepare for theological teaching positions. The remainder are involved in Christian Ministries including pastoral work, prison ministries, ministry among street children, public school ministries, Christian Radio, etc. In May 1994, the founders of SPbCU turned the responsibility for the school over to an international Board of Directors, consisting of Russian Nationals and Western Sponsoring Agencies. The Board of Directors is recognized as the legal authority of SPCU, which has appointed a Rector as Chief Administrative Officer. Operational guidelines for the administrative affairs of SPCU are outlined in the by-laws developed and approved by the Board in May 1996. In a joint effort between SPbCU and Odessa Theological Seminary the first group of Masters degree students graduated and received their MA degrees in September 1996. The mission of St. Petersburg Christian University (SPbCU) is to provide accredited higher education based on evangelical values. In all aspects of university life, SPbCU aims to create an environment, which provides for spiritual growth and the achievement of academic excellence. Following the calling of the Triune God, SPbCU prepares Christians to serve and lead in the church and society. In accordance with the new law “freedom of religious organizations” in 1998 the university was registered as a professional religious educational organization, by the Union of Evangelical Christian – Baptists. In July of that same year Victor Avdeev became the first Russian Rector of Saint Petersburg Christian University. In 1999 SPbCU was the first institution to receive accreditation for its Bachelor of Theology program from the Euro-Asian Accrediting Association. SPCU also purchased two buildings on Narvsky Prospect during 1999 and immediately began renovations which were completed in 2000 and 2003. In 2000 the first masters level students began classes thus initiating SPbCU’s master of theology program. In 2001 the leadership of the university was passed from Victor Avdeev to Fiodor Mocan. During the summer of this year SPbCU also received licensing from the Ministry of Education of the Russian Federation to conduct educational activities as a religious organization. In 2005 the leadership of SPbCU was passed from Fiodor Mocan to Alexander Negrov. Dr. Negrov has long served the SPbCU community first as a student from 1990 to 1993; as a lecturer from 1995 to today; as Vice Rector for Academic Affairs from 2001 to 2005; and now as Rector. In April, 1999 SPCU’s B.Th. Program was fully accredited by the Euro-Asian Accrediting Association. SPCU is also an international affiliate member of the Council of Christian Colleges and Universities (CCCU) of higher theological training institutions from around the world.